While the summer movie season will likely be dominated by superhero movies once again, one of the most beloved franchises in cinematic history will also get rebooted. 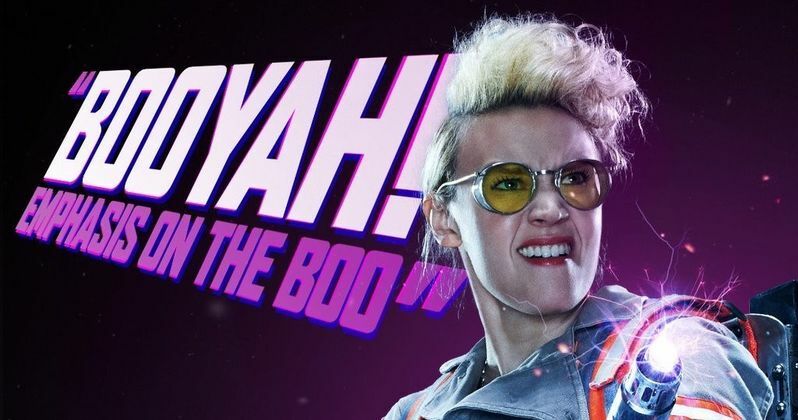 Sony debuted the first trailer for Ghostbusters last month, and while we wait for the next batch of footage, the studio has debuted three new characters posters, featuring Kristen Wiig's Erin Gilbert, Kate McKinnon's Jillian Holtzman and Leslie Jones' Patty Tolan. The next poster will most likely feature Melissa McCarthy's Abby Yates, so stay tuned for that one-sheet. The story centers on Erin Gilbert (Kristen Wiig) and Abby Yates (Melissa McCarthy), who, years ago, wrote a book that posited ghosts do in fact exist. The plot picks up with Erin acquiring a teaching position at the prestigious Columbia University, but she is laughed out of academia once word of her book surfaces. At the same time, Abby is working with a new partner, Jillian Holtzman (Kate McKinnon), just as a new slew of ghosts begin to invade New York City. Erin ends up joining forces with Abby and Jillian, along with a new partner Patty (Leslie Jones), to save the Big Apple from these ghosts. These new posters debuted on the Ghostbusters Twitter page, so hopefully we'll be bringing you more one-sheets very soon. While this movie isn't exactly connected to the original Ghostbusters, there are still a few nods to the first movie. The iconic ghost Slimer has been confirmed, and last week, new spoilers surfaced that Slimer will actually have a girlfriend in this remake, and the movie will also reference Gozer during an end credits scene. These details have not been confirmed quite yet, but they originated from a mysterious Reddit user who claimed to have seen the movie already, so we'll have to wait and see if this rumor is confirmed. The supporting cast includes Chris Hemsworth as the Ghostbusters' secretary, Andy Garcia as the mayor of New York City, Michael K. Williams as Hawkins, Matt Walsh as Rourke, Pat Kiernan as a news anchor and Neil Casey as the human villain. Original Ghostbusters stars Bill Murray, Dan Aykroyd, Sigourney Weaver, Annie Potts and Ernie Hudson have all been confirmed for cameo appearances. Sony has issued a July 15, 2016 release date, putting the Ghostbusters up against Broad Green Pictures' The Infiltrator. Paul Feig directs Ghostbusters from a script he co-wrote with Katie Dippold. Original Ghostbusters director Ivan Reitman is producing alongside Dan Aykroyd. Ghostbusters will be debuting at an interesting time, right in between huge superhero movies like Captain America: Civil War, X-Men: Apocalypse and Suicide Squad at the box office. It's possible this reboot could win a few weekends in a row before Suicide Squad debuts in early August, but we'll have to wait and see. Take a look at the latest character posters for Ghostbusters below.